Our stupidly late review of the updated 2001 game of the year. 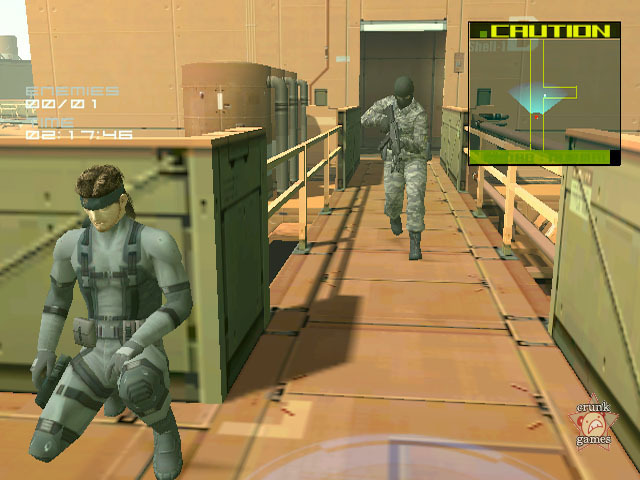 The ultimate version of MGS2, including playable Snake missions, skateboarding and other new modes. Following in the steps of the 1999 upgrade to MGS1, Metal Gear Solid: Integral, the folks at KCEJ give us Metal Gear Solid 2: Substance. MGS2S is built around and retains the original release, Sons of Liberty, but we’re sure that most of you know what that one’s all about even if you haven’t played it so we’ll forego the unnecessary story recall. However, there is the inclusion of the new Extreme and European Extreme difficulties, plus new 2002 edition dog tags! Yeah! Well there’s more than that, naturally. Once you beat SOL once, you open up the Boss Survival and Casting Theater modes, previously only in the Japanese and PAL versions. Boss Survival is self-explanatory, but Casting Theater enables you to replace characters in select cutscenes from the game. Perhaps you’d like to see one out of several Raidens exclaim "A DUHD" when facing off against Fortune? Well now you can. It’s odd enough that they provide only eight scenes, but you can only choose from a certain number of characters for each one, too (no Emma?! Man…). But the entire thing was a late addition to the foreign versions anyway and not really reflective of the entire package. 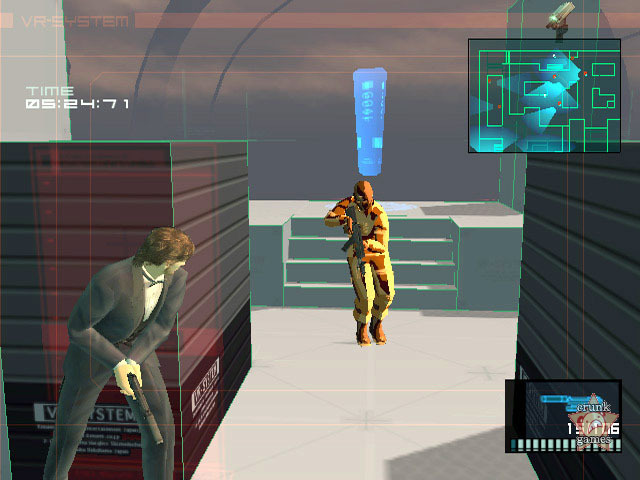 So to make Substance really alluring, Konami added a boatload of brand new VR missions to complete, just like the VR Missions disc for MGS1. You can play as Snake or Raiden or variations of them, such as tuxedo Snake or Ninja-suit Raiden. Those who know the MGS1 VR disc will feel at home here, with subcategories of levels featuring every weapon and the more far out "Variety" levels. There are also First-Person ones, which take some getting used to due to wonky controls, and Alternative Missions like Bomb Disposal and the amusing Photograph mode. In short, the VR is definitely the meatiest extra of Substance and goes a long way. 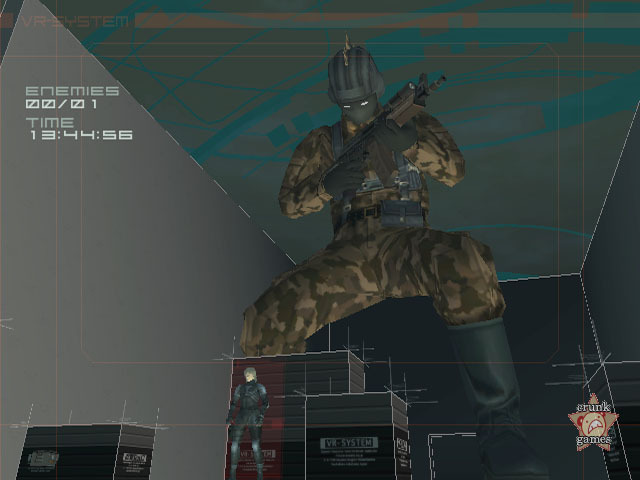 Although pre-release hype of MGS2S was of the "OMG YOU CAN PLAY AS SNAKE" variety, no one exactly knew the capacity to which the guy would be featured. In a bemusing choice, Konami devoted a handful of separate alternate-universe stories featuring Snake, aptly named Snake Tales. Each one is a mini-adventure with stories told through text intermissions. They’re even somewhat challenging as there is perpetually no radar and the (often bizarre) boss fights are relentless. The Tales throw any pretense from Sons of Liberty out the window and craft their own mythologies, which range in scale from cracked out to fucked up. 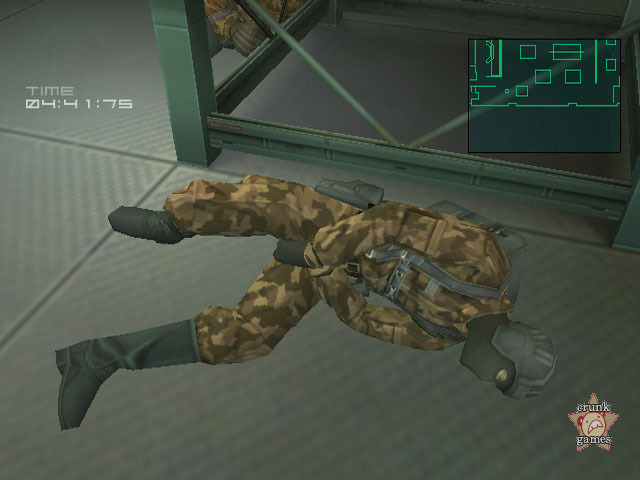 What if Pliskin really was just some SEAL doing his job? What if Meryl rebelled against the system and ended up fighting Snake Olga-style? Is there really a 50-foot soldier lurking under the Big Shell? Perhaps KCEJ was just making fun of those who decried the lack of Snake in Sons of Liberty and put a bunch of twisted, difficult missions just to piss people off even more. Secretly, we hope it worked. 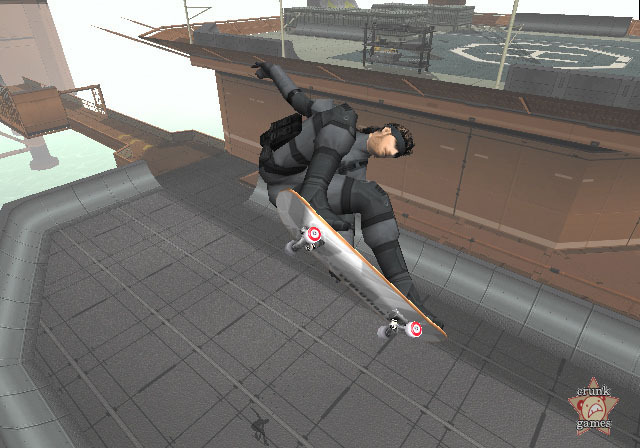 "Exclusive" to the PS2 version is the Skateboarding mode, where Snake and Raiden show off their hidden talents as they grind their way outside a modified Big Shell. Truthfully, this is a slapped-in custom demo of Evolution Skateboarding, Konami’s very own Tony Hawk rip-off. And because it’s separate, you can’t save any of the progress you make. Couple that with a pile of vague level goals and a narrow time limit and you have something that is best left for cheap laughs or hopeless boredom.